Please share vinyl playback ideas and perhaps funny horror stories! Specifically, I'm struggling with the physicals of vinyl cleaning. I have a three solution cleaning setup. I've read where people change the tube on the RCM between each stage. That people use a squeeze bottle for each fluid. That distilled water is used to clean the brush each time. That you have something to put on the RCM table at least specifically for dirty vinyl. Etc...etc...etc. So I'm trying to figure out how to neatly and cleanly keep all this stuff handy and close. And setup to not manage to spill all over at that!. I do have the VPI setup on a metal roll-around that has a door on the front and a couple shelves inside...so have some storage space. But how do you handle all the cleaning, where do you set things down and so on? Do you go to the kitchen to do your cleaning where you have counter space or something? 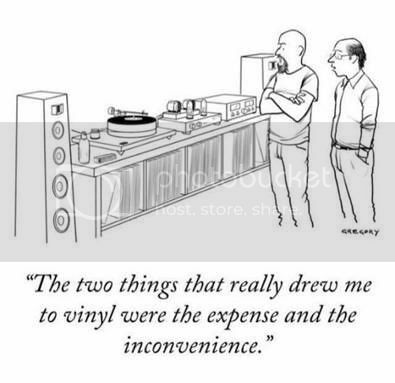 But I think it'd be fine to share any other vinyl stories too that you have.